Having backed the new LimeSDR mini crowdsupply campaign, I am expecting delivery of a highly capable software radio with the ability to receive and transmit at frequencies up to 3.8GHz. This is brilliant and the small size means that it can always be in my bag as and when I need to investigate some RF signals. But what antenna do I use? Most people would settle for a mag-mount monopole, but these are inherently narrow band and while you can telescopically adjust the length it is pain and hard to get the frequency spot on. Also as an omni-directional antenna its not much good for hunting unknown signals. What I wanted was a small very wide-band antenna with plenty of gain. The solution is the Ultra Wide Band(UWB) antenna. 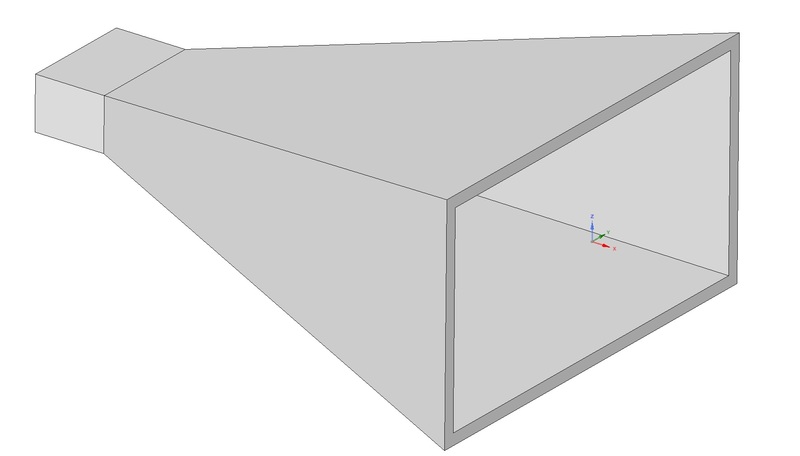 In this series of posts I will discuss some of the candidate antennas, detail why I selected the one I did, discuss the chosen design, introduce some of the tweaks to improve performance, and provide some measured results. A UWB antenna is designed to work on a wide range of frequencies. Typically much more than an octave of bandwidth. Thats a lot when most antennas stuggle to acheive more the 20 or 30% bandwidths. Often these antenna designs are used for UWB comms systems. These are designed to spread their transmit power over a really large portion of bandwidth such that the interference to any particular conventional RF channel is negligible. 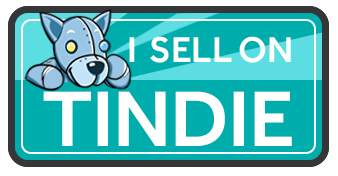 Its an interesting technology but with a few exceptions has yet to catch on on a large scale commercially. These antennas are also often referred to as Frequency Independent antennas, but for the purpose of this blog I will stick to UWB. There are some downsides to UWB antennas. Primarily, a narrrow band antenna acts as a first stage filter for your receiver. This prevents strong out of band signals from overloading you receiver and causing spurious signals. If you only need to work on one or two bands, a UWB antenna is not the best choice. As with most antenna’s there are a number of ways to look at how they work. Personally, I like to imagine how the antenna can be created by gradually adapting the shape of an antenna that I previously understood. At every point in this transformation a new antenna can be created that should in theory work, although may need some tweaks with the feed structure and impedance matching. This is often the way I will explain to people how an antenna works, so here is a quick example. 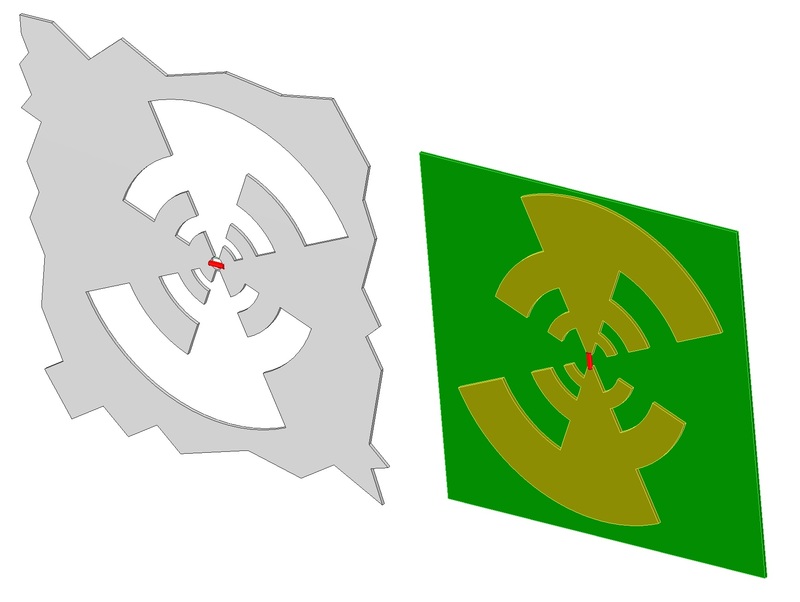 In the above image you can see one possible relationship between a Horn and Dipole Antenna. Along the way I created a Tapered Slot Antenna. So what are the candidates for my UWB antenna. There are many ways to make such an antenna. Each has it’s pro’s and con’s and books can be filled about each varient. This list is by no means exhaustive, but I think it covers the majority. Again, I wont go into the analysis or performance of these antenna in detail, but merely present them so that you can see the rough form factor of each. 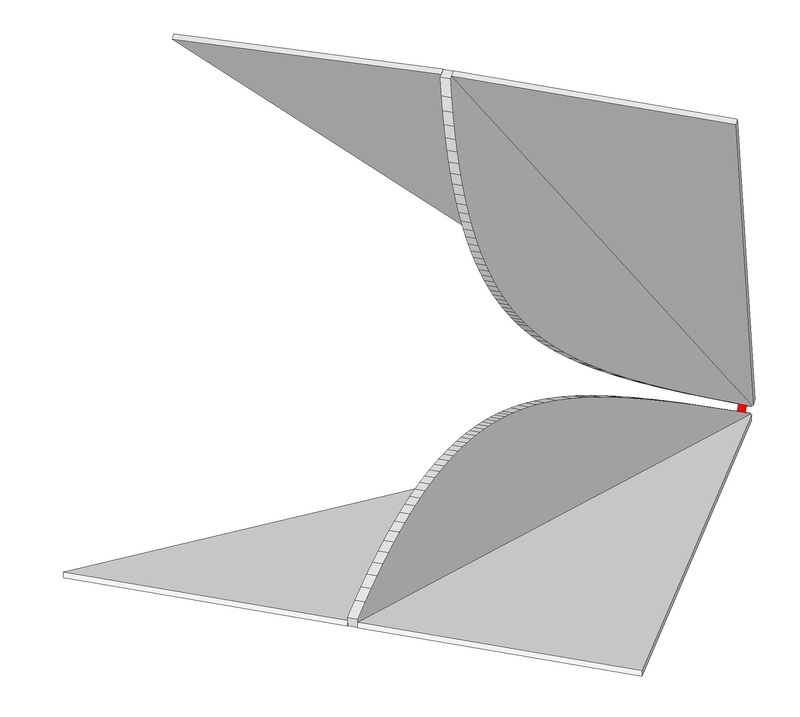 The discone is literally constructed with disc placed on top of a cone and a feed between the two shapes. There are a few ways to look at how this antenna works. One way I like to look at this is as a Bowtie style antenna, where it has been revolved into 3D and the top element is squashed flat. 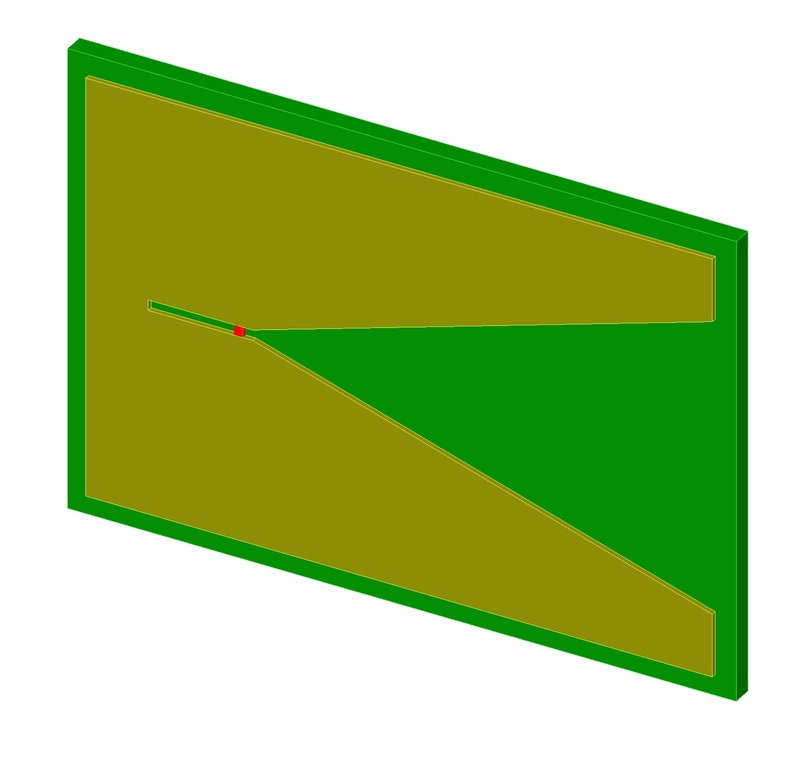 Another way to look at this antenna is as a form of Tapered Slot Antenna(see below) that has been revolved in 3D around its feed point -to make a 3d shape. Or alternately as a circular horn antenna. 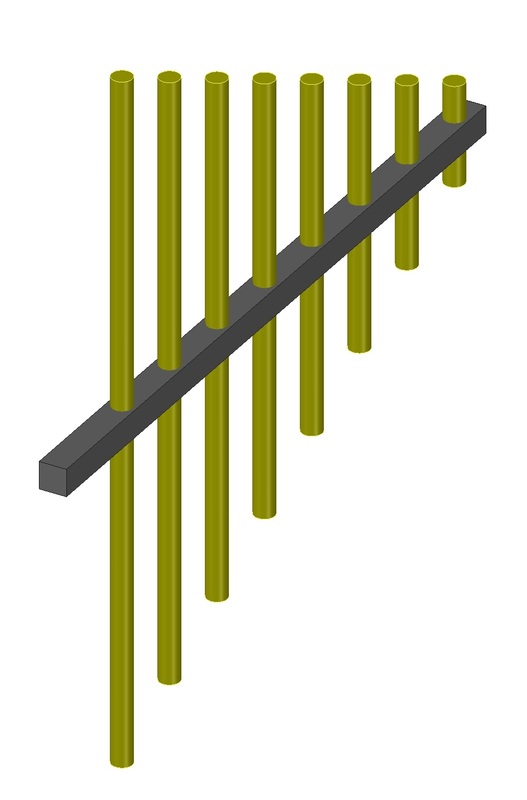 The discone is normally made of wire elements rather than solid metal, but the performance is very similar. Some even have a aditional vertical element on top to provide extra performance at the bottom end. If you have a mast and can only put up one antenna, the discone is a great option. Normally just called a Log Periodic or Log-P. This is like a Yagi but with progressively shorter directing elements. In this antenna the non-resonant elements present a poor impedance match to the feed signal. When the feed reaches an element of appropriate length it can flow down that arm. The elements in front and behind this resonating element act as a director and reflector in a similar way to a standard Yagi. Hence this antenna has a small amount of gain, which is fairly stable over the frequency range. This antenna is regularly used in EMC testing labs. Probably because the gain is fairly constant over frequency. There are several examples of PCB versions of this antenna, which make it easy to fabricate and also fairly thin and light. Log Periodic Tooth Antenna with it’s complementary version. 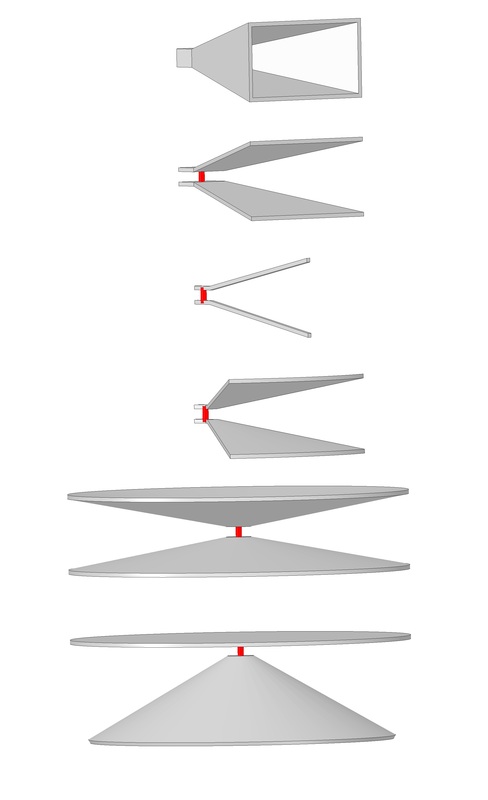 The Log Periodic Tooth Antenna is derived from Bowtie dipole antenna. This is a really cool antenna as it can also be manufactured by cutting the shape into sheet of metal. In this form it is a complementary antenna. I havent seen this antenna in much real world use, but its cool nonetheless. There exist many types of spiral antenna. 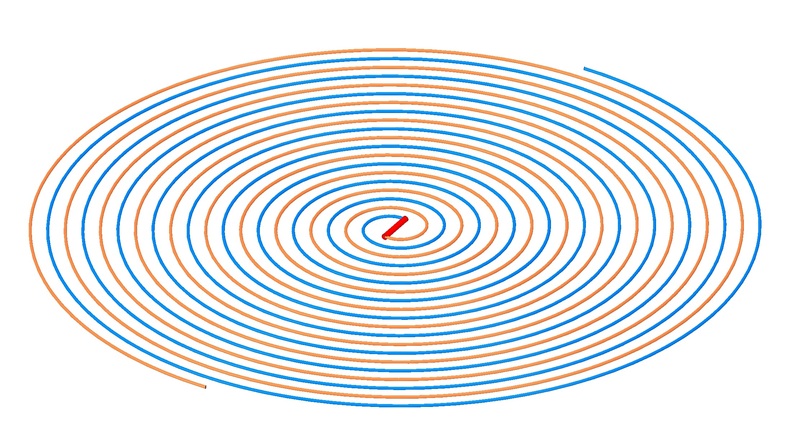 The one shown is ans Archimedean Spiral Type, but logarithmic types are also popular. 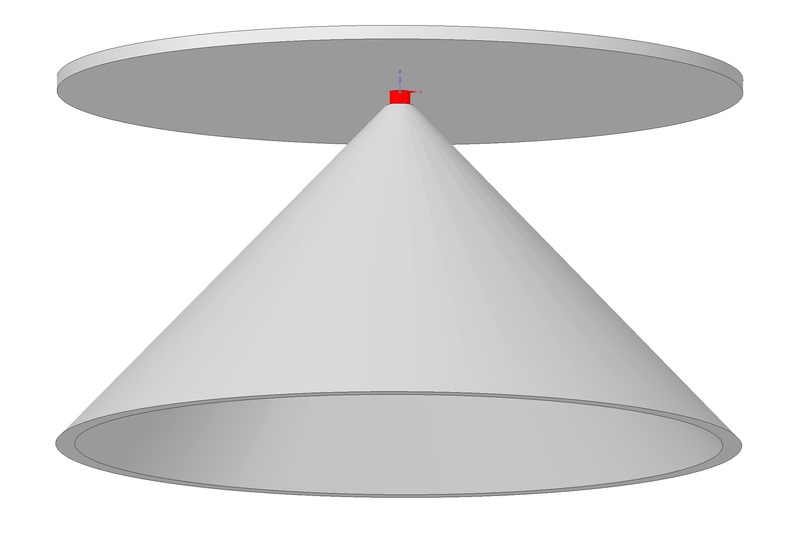 The antenna has circular polarisation and maximum gain in the direction of the central axis. Gain can be increased by placing this above a ground plane. If you need wide band circular polarisation, this or a variant of it is a great candidate. Very popular at high frequencies and can have really high gain as it has a very large aperture. A kind of combination of a Vivaldi(i’ll get to this one) antenna and a Horn antenna. Often used as a gain standard for antenna measurement ranges and chambers. Normally a 2d PCB printed antenna, this normally consists of a circlular (or semi-circular) antenna element above a ground plane(or above another circular element for a dipole style). Sometimes these antenna use elliptical or exponential curves instead of pure circles. 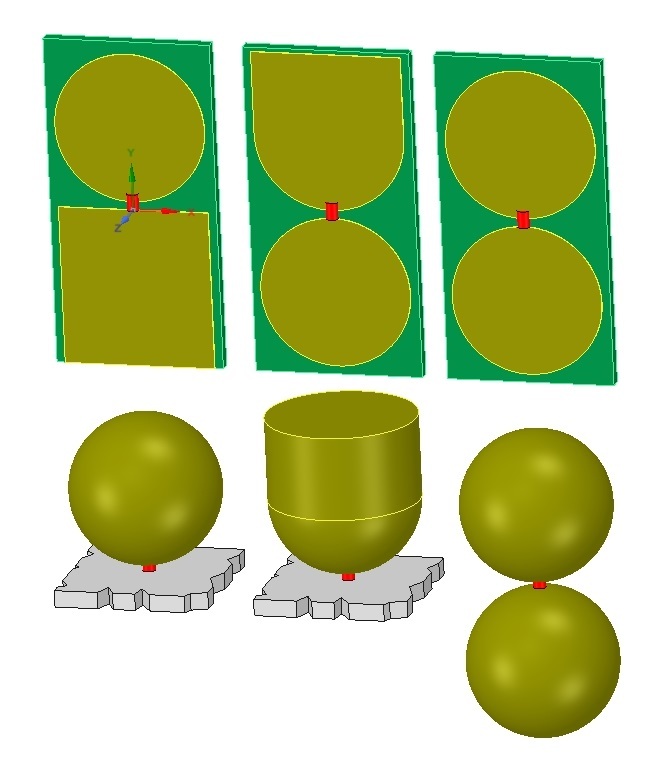 In 3D implementations they use 3D spheres orhemi-spheres. I see this as a 2D slice of a horn antenna. Because of it’s 2D nature the effective aperture is somewhat less and hence this antenna has less gain. Like a standard slot antenna the impedance can be tuned at a given frequency by moving the feed towards or away from the shorted end of the slot. In the follow on to this post I will show the antenna that I have chosen. Its a really cool variant of the Tapered Slot Antenna. I owe a huge debt of thanks to others who have shared valuable antenna design information online. I have a number of good books on this subject and I may provide some recommendations in a future post, but for now these sites are well worth looking into for anyone who needs more information about UWB antennas in particular. Microwave101 encyclopedia this site goes wider than just antennas, but the content is just brilliant.